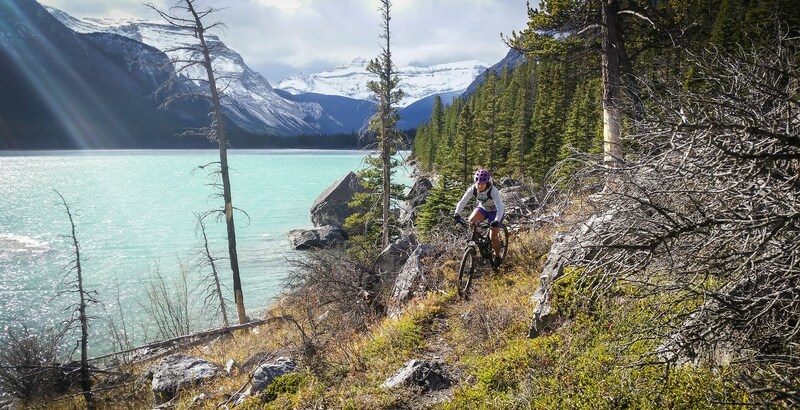 The one problem with riding Lake Minnewanka is that it’s an out and back. 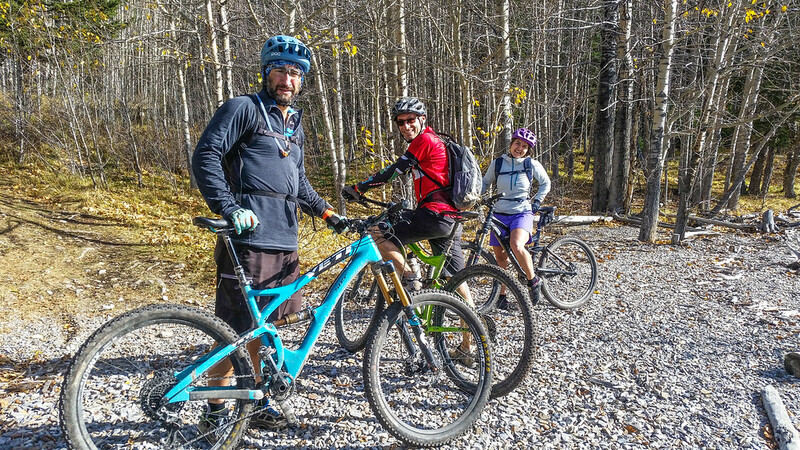 And it’s a busy and out back, popular with hikers and bikers alike. And so when we rode out, and reached the cabin, I was happy to keep going, and put off the return journey. 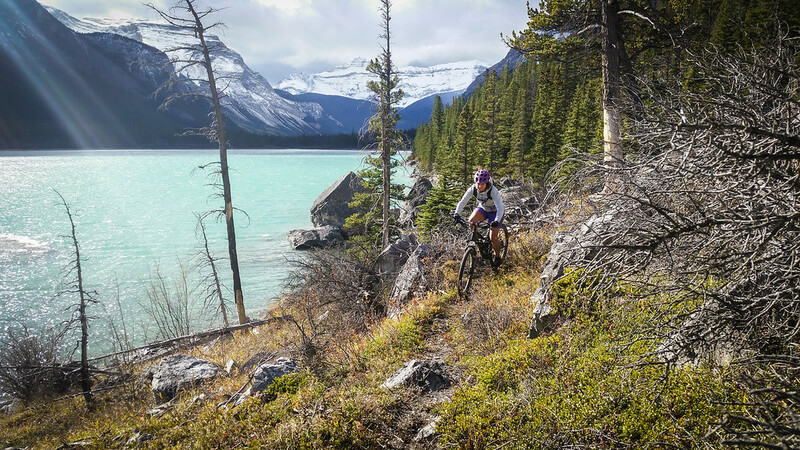 I’d never ridden past the cabin before (it’s at 15km, and makes for a nice 30km round trip) and Minnewanka was in great late season condition. And so we got up towards the end of the lake. The terrain becomes more technical, and it’s much harder to ride everything. There was almost no deadfall though. 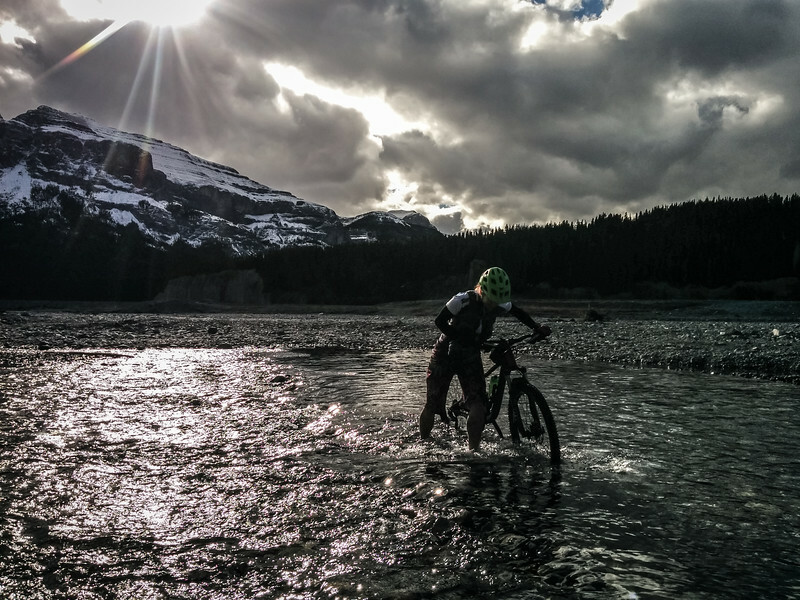 A couple of big wash outs from the 2013 floods were slow going, but as we drew closer to the end of the lake, I realised that I really wanted to keep riding. I only had one bottle of water with me though, nearly empty, and just one bar left. Thankfully I have friends who come oversupplied, and I stocked up on both water and food, and even managed to convince Danika to come along with me. Meanwhile, I passed on Alex’s phone number, so he would get the heads up that I might phone begging for a lift when we emerged into cell service at the other side of the ride. And so the two of us set off into the semi-unknown. There were two creek crossings ahead of us. The first was at the end of the lake, where you cross onto the south side of the river. It ended up being the deepest, at mid thigh, and bracingly cold. 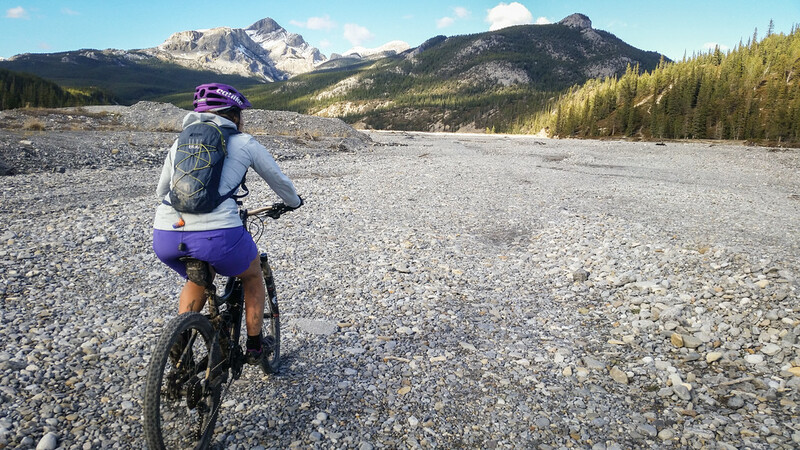 From there, we were onto well-travelled horse trails, much more well defined than the eastern Lake Minnewanka trail, but also much muddier, much more rutted, and much more inclined to have snow due to the aspect. But it didn’t really take long at all to get through that section, then we were out onto double track, then crossing out of the Banff National Park and into the Ghost Wilderness Area – where civilization quickly caught up with us, with 4WDs wandering about, and groups camping everywhere. The second river crossing was a breeze, and soon we were pedalling up the big hill, onto fairly well-travelled gravel roads. 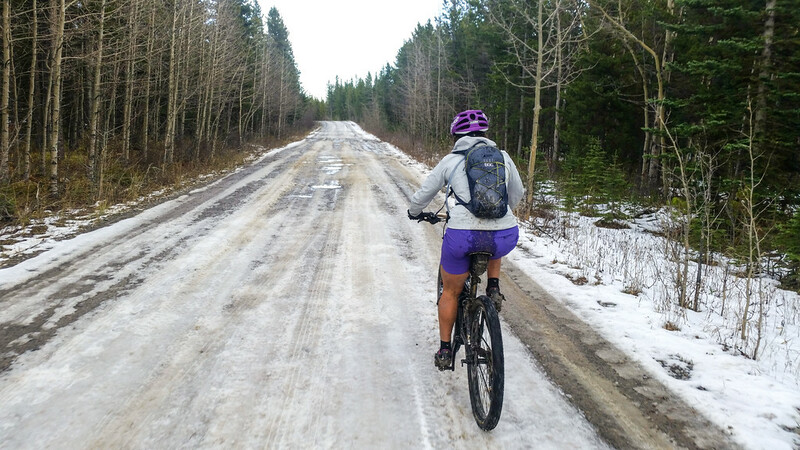 Well-travelled gravel roads that were covered with snow and ice for kilometres on end! But still fun to be exploring new terrain, and a thoroughly worthwhile adventure, although I’d still like to ride the full loop from home. And for reference – there’s cell service on and off for most of the ride, definitely far more than we were expecting anyway. And we were picked up about 10km shy of reaching the 1A, to make for a 66km ride an an unexpectedly long day. Previous PostPacking for bikepacking with kidsNext PostOne last ride for the season!